Gut health is the foundation of overall health, if there are imbalances in our gut then it can lead to symptoms that affect the rest of our body, and many chronic conditions stem from poor gut health. Digestive conditions are more and more prevalent, as our modern day fast-paced lifestyles take a toll on our gut health. Stress, medication, diet, poor sleep and environment are just a few things that can affect the health of our guts, and in some cases a vicious cycle of these factors and chronic inflammation can lead to more severe gut conditions like inflammatory bowel disease (IBD). The gut hosts trillions of microorganisms including bacteria, yeast, viruses, fungi and parasites, that make up the gut microbiome. The digestive environment is not only important for gut health, but is strongly linked to other functions and systems in our body including the immune system and mental health, as well as blood sugar control, and weight management. It can be negatively affected by poor diets, antibiotic use and chronic stress. Diverse Diet. Eat a variety of whole foods which can lead to a diverse microbiome, with a wide variety of strains contributing a number of health benefits. Up your Fibre Intake. Eating an array of plant based foods provides nutrients for the microbiome. Fruits, vegetables, beans and whole-grains are high in fibre which is digested by certain gut bacteria supporting their growth. Fermented Foods. Many fermented foods are rich in probiotics, prebiotics, enzymes and other nutrients that can support digestive health. Try our Lions Mane powder Kombucha Recipe. Prebiotic Foods. Foods like asparagus, leeks, bananas and jerusalem artichokes are rich in prebiotics which will feed our good bacteria and allow them to thrive. Beta glucans contained within mushrooms is also prebiotic and helps to feed the good bacteria. Consuming mushrooms regularly has been shown to be beneficial for gut health. A recent review found white button mushrooms helped to increase microbial diversity, and alter gut flora composition. Chaga powder and Maitake mushroom supplements have also been found to have gut health benefits, including alleviating GI disorders, supporting numbers of good bacteria and preventing viral infections and candida that contribute to digestive problems. Lions Mane powder has also shown benefits for digestive health. It has natural antibacterial properties that can protect the gut from damage and may inhibit growth of H.Pylori which is linked to stomach ulcers. It has been shown to reduce inflammation and prevent tissue damage in the GI system and may show benefits for IBD, supporting the regeneration of the intestinal lining, and protecting against leaky gut. 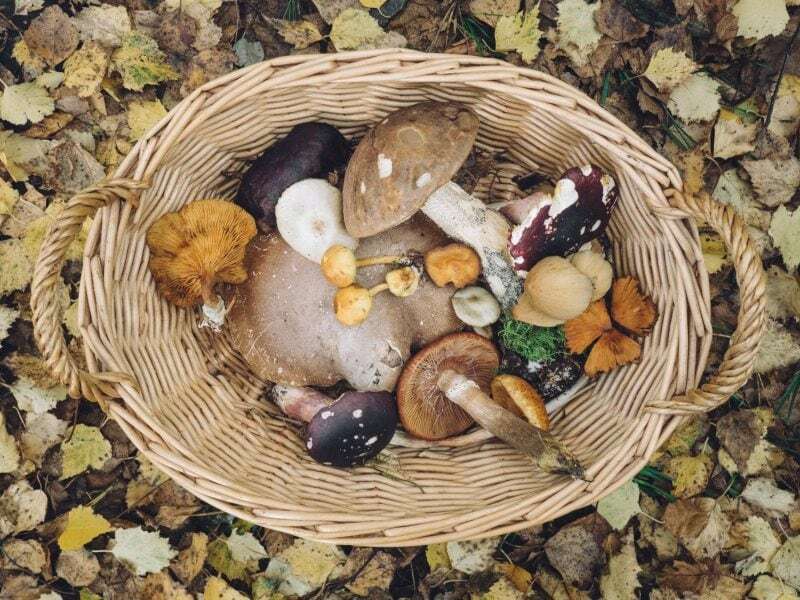 Reishi mushrooms powder has been shown in studies to have prebiotic properties and the ability to modulate the gut microbiome, helping to feed and sustain beneficial gut bacteria. It is the most anti-inflammatory of the mushrooms, and many diseases like IBD are driven by chronic inflammation. Shiitake has anti-viral, anti-bacterial and anti-fungal properties, as well as an ability to support the immune system. It contains the polysaccharide lentinan which is a powerful anti-fungal useful against various viral and parasitic infections. Gut health and the microbiome have appeared over the last few years to be an increasingly important area of health. Taking care of our guts throughout life can support our overall health and well-being and help us to lead a happy and healthy life.